Far Cry has been an iconic franchise since the first one launched. Released in 2004 it was a collaboration between Ubisoft and till then relatively unknown Crytek GmBH who used their own in-house tech (CryEngine) to create an open-world, sandbox first-person shooter out of a graphical tech demo. It not only catapulted the developers to stardom but also broke new ground in the first-person genre which till then had to straddle between going for the Half-Life approach or id software’s approach (Doom, Wolfenstein) when it came to game design. The game was so popular that Ubisoft bought the IP from Crytek and has been developing all the successors since including the latest entry, Far Cry 5, in-house. Far Cry 5 is as the number suggests the fifth mainline entry in the franchise which has seen a total of six releases including spin-offs such as Far Cry Primal and Blood Dragon so far. We went hands-on with a PlayStation 4 Pro build at the recent IGX 2017. 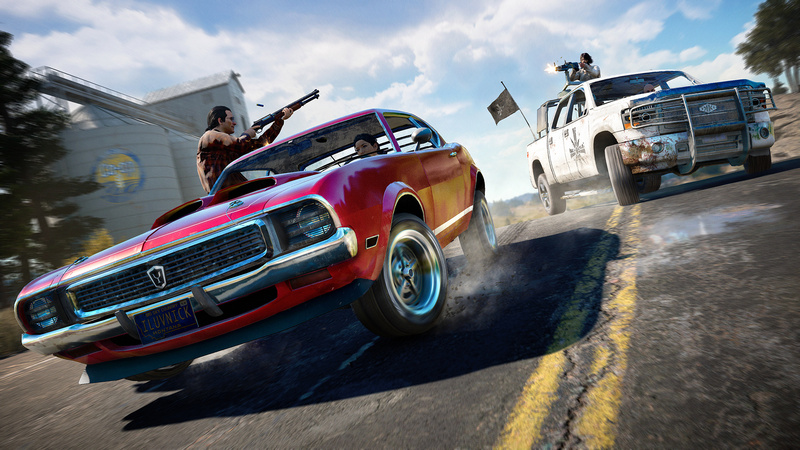 The game picks up most of its game mechanics from the more recent releases in the franchise, which means the fictional Hope County, Montana is a free for all that players can approach however they want. In the preview build, we had free reign to retake the settlement of Fall’s End and explore its vicinity. One of the major differences from the recent releases was a watered down version of Far Cry 2’s buddy mechanic being brought back. Players are capable of picking a ‘Gun for Hire’, an ally for the mission if they want. They are not as fleshed out as the handful of mercenaries in the former, but they serve the same purpose. You get someone to pick you up in-case you get stuck in a firefight or assist in taking an object and in the most egregious circumstances an extra meatshield thanks to this. Thankfully there is no rage-inducing ‘Malaria’ mechanic like in Far Cry 2 waiting to strike out from the blue or guns that jam up without fail at inopportune moments in gunfights. Combat here mostly progresses just how it was in Far Cry 3/4. Settlements and areas of interest are protected by mooks and you have to take out the local commander or alarm system to prevent a veritable horde assembling against you. The core gameplay loop remains the same giving you free reign to approach any scenario as you see fit. You can stealthily take the objective or step in guns blazing or any other approach on the spectrum. The gunplay on the PlayStation 4 Pro was satisfactory. I generally do not play on consoles but could manage everything fairly well. With a year on the drawing board, Ubisoft has definitely eliminated some of the bloat from the game. The tried and tested albeit tiring tower mechanic system has been replaced by having players liberate settlements. This opens up local activities and progresses the narrative. During the preview, once we had taken back Fall’s End, we unlocked the local watering hole which in all subtlety was named the Spread Eagle where we spoke with the point-NPC for the settlement who unlocked a follow-on campaign objective. We could head out to contact Nick Rye at his airstrip or explore the area around the settlement. The preview build didn’t have any crafting or RPG lite levelling mechanics but they will probably be in the final game. A fishing mini-game is also confirmed for the final release. 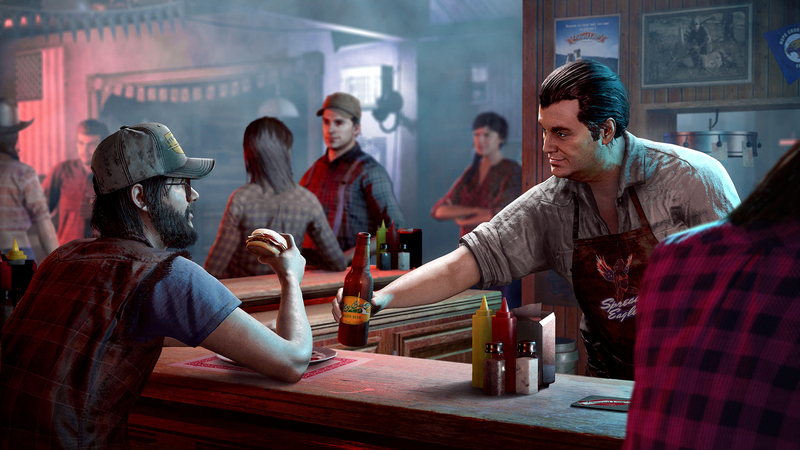 The meat of the game’s narrative focuses on the cult of Project at Eden’s Gate set up by the fanatical Joseph Seed and his siblings who have taken over Hope County, Montana. This is another aspect of the game that dovetails into the franchise’s ongoing vignette of offering a charismatic, megalomaniac antagonist vis-à-vis a rag-tag party of resistance fighters that the player character falls in with. On a technical level, the build running on the PlayStation 4 Pro ran at a fairly decent framerate without looking too shabby. This is a very old build so we expect a lot of improvements in the final release that is scheduled for February. Overall, Far Cry 5 looks to be iterating on the now tried and true Far Cry 3 formula of leaving the player to their wits with a smorgasbord of content. I look forward to playing the full game closer to its release on the 27 of February 2018. You can pre-order the title from GamesTheShop or your preferred digital or physical retail platform.